Inspired by the world around me, my obsession with metal is to apply pattern and form using sheet and wire to create jewelry that speaks to the heart and soul of an individual. 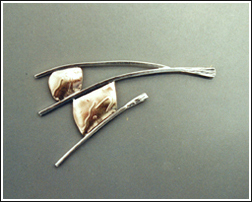 Often the resulting finished piece is quite different than the idea I begin with, the metal and the spirit guiding the process. Being challenged through custom design or jewelry repair provides the opportunity to expand skills, and often leads to new resources within myself. As a juried member of the League of New Hampshire Craftsmen since 1988, I have been involved with the League's exhibits and shops, as staff at times, and as a source of product. I work with local schools, teach teens and adults in my studio; and provide mentoring for any who desire it.